This program is an enhanced, drop-in replacement for the DOSKEY.COM that ships with MS-DOS and Windows 9x/Me. Although enhanced, it has a smaller disk and memory resident footprint. It is a great addition to DOS boot diskettes, and to the Win 9x/Me environment if the DOS box is used frequently. Note: will not operate under Windows NT/2000/XP (it’s not needed since those systems have completion mechanisms built-in). The primary added feature is command and file “auto-completion” via the tab key. I’ve replaced it on my vintage DOS tower’s AUTOEXEC.BAT. I know it’s cheating a little, but wow having tab completion on DOS is glorious! 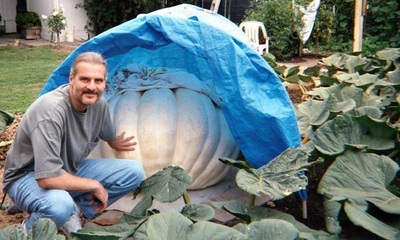 What’s more amazing though is Paul’s homepage with the above image of his rather large pumpkin. I endeavour one day to have a homepage even 1% as good at this.